Whatever you think about indoor/outdoor cats – it was absolutely fascinating to see the distance each cat travelled and it was easy to see where there were many cats and where there were fewer. Oh, don’t get us going on the girl cats! They don’t roam quite for far but hell, once they have a territory, are you sure you want to go there boy cat?! Hahahah! 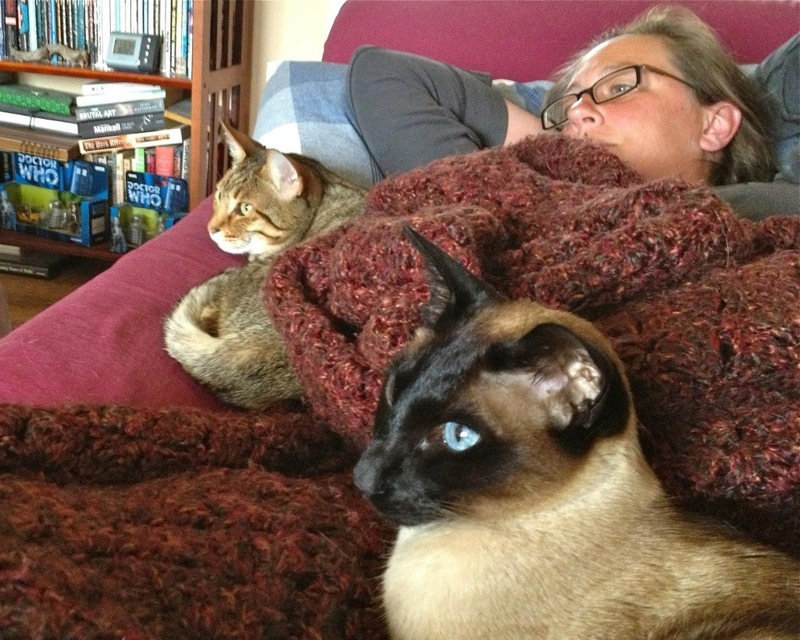 One of my favourite memories is our slight-bodied Siamese, Bambi (we did NOT name her!) chasing a stray German Shepherd out of our front yard. She was incredible. I’ll never forget seeing her charge down the driveway and the dog running like all the devils of hell were after him! And let’s not forget my Nickel shrieking like a fire siren and peeing at the invader from the upper deck earlier this month. Seems more of a fear reaction on Nickel’s part. Skinny little Bambi-cat wasn’t scared of anything. But she always came to comfort me when I cried, as a kid. 🙂 You are all so synchronized. If I took a pic like that of me and the dog, she’d be looking elsewhere. And your bookshelf is exactly how one should be, racked with books and the necessaries like Doctor Who collectibles. Nice to see you relaxed and enjoying your down time! lol I had actually not noticed the bookshelf, even less the Doctor Who collectibles. Yes, I’ve been a fan for 30 years. I’m not one of these new Who fans. And that’s just one of five of my bookshelves: one is classics and general modern fiction, one is non fiction, one is entirely King and Koontz, one is DVD’s and the one in the pic is sci-fi and horror. Molly dearly loved a black lab on that channel. Aw, you should have tried to record it for Molly! Oh good, another chance! I’d be fascinated to know if she got bored of watching the same show over and over. The dog was watching the TV too, but on the other side of the room so not in shot. Maybe try to get the Secret Life show and see what the reaction is? Your cats are very attractive… and attracted by the TV ! Thank you, Cookie’s Mom! It is rare that they watch TV, but of course this show had them hooked! Thanks! It also shows how we hog the couch, doesn’t it? Hehehe.